The game marked the season debut of last year's defensive player of the year, Todd Morton (Delaware / West Chester, PA) who made a pair of saves to earn his fifth career shutout. Simone Raiola (Grand View Univ. / Triuggo, Italy) and Alex Rose (North Carolina / Cary, NC) each scored their first goals of the season to help avenge a narrow 1-0 loss back on May 19. "It was a great win for the lads tonight," said Nor'easters head coach John Thompson. "We were up for this game from the first minute. We just had some really great moments in the game and we battled hard for the win until the final whistle." The Nor'easters' 22nd home opener was a rainy one but the team rewarded their loyal, rain-soaked fans with an early goal. In the 15th minute, Simone Raiola intercepted a pass in Ocean City's offensive third, caught Long Island goalkeeper Dylan Castanhera off his line, and launched a shot from about 35 yards out that found its way into the back of the net. It was Raiola's first PDL goal of the season, but the second goal in all competitions. Raiola scored Ocean City's second goal in the club's 3-0 road win over AFC Ann Arbor in the First Round of the Lamar Hunt US Open Cup back on May 9. Ocean City would double the lead after halftime when Alex Rose would make the most of his first career start for the Nor'easters. The ball was played in to Fredlin "Fredinho" Mompremier (Fairleigh Dickinson / Limbe, Haiti) who had his back to the goal inside the penalty area. Mompremier, Ocean City's leading scorer from last season, laid the ball off to Rose on the right wing and he beat the keeper to give the home team a 2-0 lead. Rose, who will be a sophomore at North Carolina in the fall, is ranked No. 39 on the PDL's Top Prospects list. 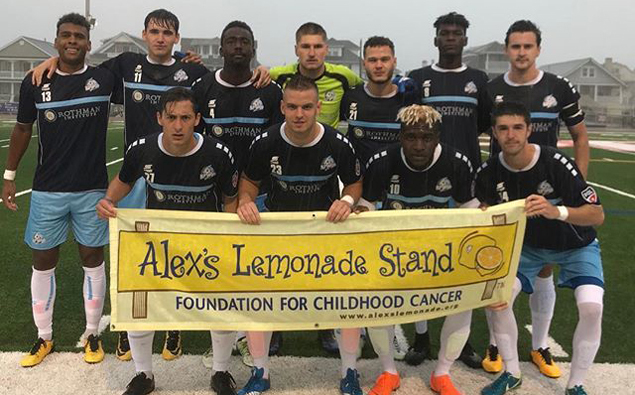 The Ocean CIty defense held strong, limiting the Rough Riders offense to just four shots and earning the team's first shutout of the 2018 PDL season. Naturally the club's Unsung Hero of the game came from a strong defensive performance by James McLaren (Missouri Valley College / London, England). "James won a lot of balls in the air and was a brick wall at his center mid position tonight," said Thompson. The win also extends the Nor'easters' home unbeaten streak to 10 games, the second-longest streak in club history. The streak dates back July 10, 2016. The last time Ocean City held a 10-game home unbeaten streak was back in 2004 when the team was in the midst of an all-time league record 28-game home unbeaten streak that stretched from June 14, 2003 until July 12, 2006. The Nor'easters improve to 2-2-0 on the young season, while the Rough Riders suffer their first loss of the 2018 league season. The win keeps Ocean City in the hunt for the division title and a playoff spot. While still early in the season, teams like Reading United AC, the New York Red Bulls U-23s and the Long Island Rough Riders aren't going to drop many points, so every win will count. There is currently a three-way tie for first place in the Mid-Atlantic Division with 12 points and while the Nor'easters have just six points from their first four games, they have played two fewer games than the Red Bulls and one fewer game than Long Island. They also have three games scheduled with Reading United AC (4-0-0), two of them scheduled to be played in Ocean City. The Nor'easters will head back out on the road for their next league match as they travel to Virginia to take on Evergeen FC, next Saturday, June 9. Kickoff is scheduled for 7 p.m. The next home game for the Nor'easters is on Wednesday, June 20 when they welcome long-time rival Reading United AC to The Beach House.